Geddes House is a traditional Georgian family mansion which sits in a 1,000 acre Highland estate near Inverness, in the north of Scotland. 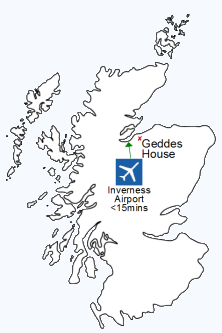 It provides ideal self catering accommodation for Scottish holidays, weekends and short breaks away. The eight bedroom mansion, which sleeps up to 17 people, is situated on a working family farm and home and is full of Scottish character and history. It is pet friendly and is relaxed and unpretentious with a warm atmosphere. Guests soon feel the house is their own. The vast surrounding estate invites guests to come and walk the woods and beaches; shoot, fish, play golf, ride and explore the Highlands' many attractions. The owners are nearby and will advise and help arrange all chosen activities for guests. Geddes House has long played host to memorable shooting parties and house parties.